The Healthy, Hunger-Free Kids Act of 2010 (HHFKA) established a Farm to School program in order to assist eligible entities, through grants and technical assistance, in implementing farm to school programs that improve access to local foods in eligible schools. Designed to increase the availability of local foods in schools, grants can help new farm to school programs get started or expand existing efforts. Funds support a wide range of activities from training, planning, and developing partnerships to creating new menu items, establishing supply chains, offering taste tests to children, purchasing equipment, planting school gardens, and organizing field trips to agricultural operation. The Food and Nutrition Service (FNS) will competitively award grants to eligible applicants for projects that meet the purpose of the grant program. Planning Grants - Intended for eligible entities that are just getting started with farm to school activities. Planning grants should primarily focus on goals and objectives that lay a solid foundation for launching or scaling up farm to school work. Key activities for a planning grant proposal include (but are not limited to): collecting data; engaging stakeholders; identifying gaps in knowledge and resources; and pinpointing and developing solutions for obstacles that hinder farm to school programming for a particular community. Implementation grants - Intended for eligible entities to scale up or further develop existing farm to school initiatives. Applicants may focus on a relatively discrete set of schools as direct recipients of project activities, or may provide products and services that have national, regional, or statewide relevance and scope. As such, eligible activities may include: training and technical assistance; supply-chain development; evaluation activities; curriculum development; creation of promotional materials or campaigns; and formation of networks or coalitions; among other activities. In addition to these activities, state agencies are well-positioned to develop strategic plans and coordinate efforts among schools and with other states. Working at the state level offers opportunities to incorporate farm to school strategies in trainings and professional development opportunities, while also identifying barriers and exploring options for addressing existing barriers at the state and school levels. Training grants - Intended to support eligible entities to conduct state, regional, and national level trainings that strengthen farm to school supply chains and/or increase trainees knowledge and capacity related to local procurement, food safety, school gardens, culinary education, and/or integration of agriculturebased curricula. Applications that have a specific emphasis on developing supply chain relationships by connecting local producers to school food buyers will also be considered. Applications from school districts (i.e. the school district is the lead applicant): schools or school districts will receive at least 50 percent of the overall number of planning and implementation awards. Applications from Indian Tribal Organizations and entities serving Native communities. Projects that reach more than one school. Projects that serve a high proportion of children (at least 40 percent or more) who are eligible for free or reduced price meals. Planning and Implementation Grants - Eligible applicants are Schools; State and local agencies; Indian tribal organizations; Agricultural producers or groups of agricultural producers; and Non-profit entities. NOTE: Eligible schools are defined as pre-K-12 School Food Authorities (SFAs), non-profit private schools, charter schools, Indian tribal schools, and others that participate in the National School Lunch or Breakfast Programs. Eligible SFAs may apply for funding that spans the entire SFA, for a specific group of schools (e.g. only K-5 schools within an SFA), or for an individual school. In the case where an SFA exists, the application must come from the SFA, and only one application per SFA is allowed. Training Grants - Eligible applicants are state and local agencies, Indian Tribal Organizations, agricultural producers or groups of agricultural producers, and non-profit entities. Applications were to be submitted by December 4, 2018. A similar deadline is anticipated annually. Up to $7,500,000 is available in total funding. 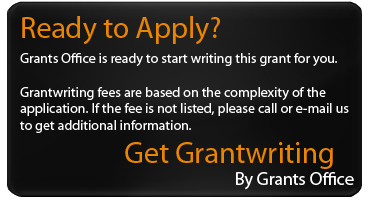 Planning and training grant awards range from $20,000 to $50,000, and implementation grant awards range from $50,000 to $100,000. Cost sharing/matching of 25% is required for all categories.